Our product design is based upon 3 key pillars. Our 2019 catalog and Techo-Spec just came out! 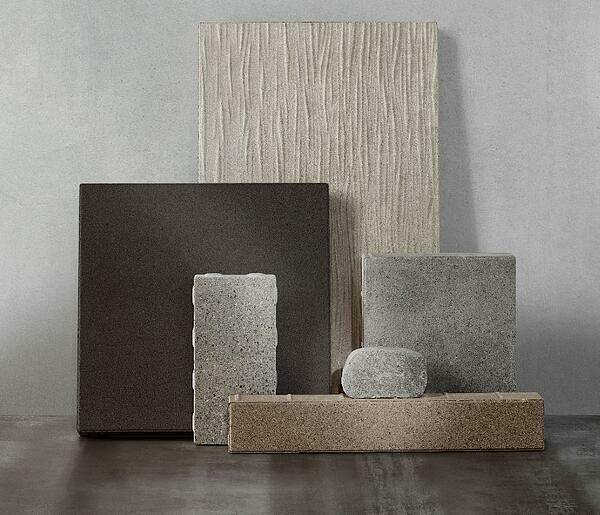 Since the very beginning, we've conceived our products with 3 key pillars in mind: color, texture and scale. Consult our resources and gaze upon the widest selection of landscape products in the industry! The team at Techo-Bloc keeps product design top of mind. We work hard every year to come up with innovations that will blow your socks off. Last year even saw the release of the brand new HD2 technology. Are we done? Techo-Bloc is never done. Shapes, colors, scales, proportions, materials and finishes all come together to create an extremely diverse product offering for homeowners looking to express their own style to the fullest. One of our greatest strengths is our colors. A wide range of colors are featured in multiple product collections, making it easy for homeowners to mix, match and contrast. Every house has a unique exterior and a design with strong color statements can definitely enhance the best features of your client’s landscape. Sure, our paving stones look beautiful. However, our landscape products are exposed to the fury of the elements. Do their colors fade with time? 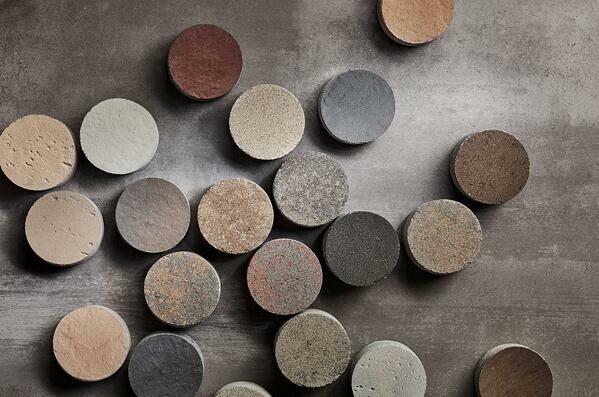 The beauty of using thermodynamically-stabilized iron oxide pigments in our manufacturing process is that they will resist everything that Mother Nature can throw at them. 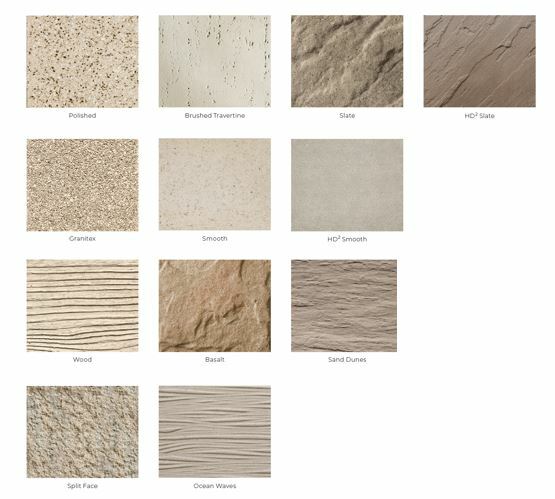 Slate, Wood, Granitex, Split Face, Ocean Waves…you'll be out of breath before you can name all the textures Techo-Bloc has to offer. Our product design takes inspiration from every corner of this beautiful Earth. 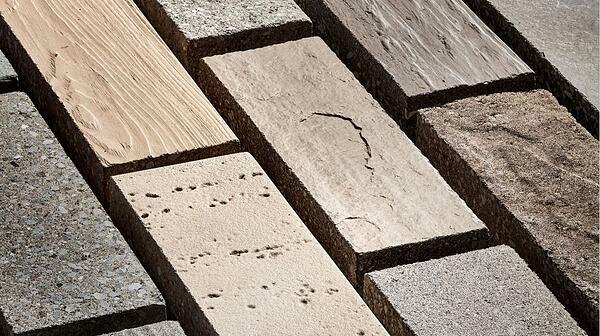 It may be concrete, but we replicate nature so well our textures stay true - even to the touch. 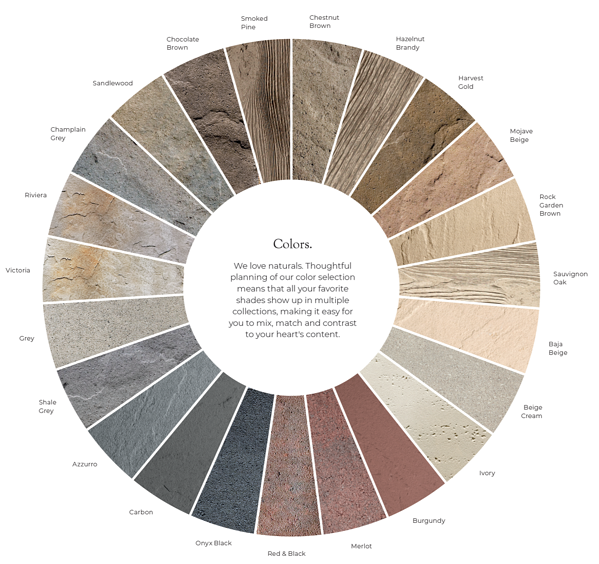 Our surface appearances range from super smooth to ultra-detailed, giving your client plenty of options to mix and match to their heart’s content. There’s a paving stone that fits every sized area you need to work with, from larger than life to small and every size in between. When discussing around the kitchen table with your client, suggest large paving slabs for grand spaces, and have fun showing them the design possibilities smaller stones can bring as banding, contouring and mosaics. Our paving stones range from Squadra and Valet, the smallest members of the Blu Family, to large 30 x 30 Travertina Raw slabs. Our biggest wall block to date is so massive you’ll doubt it even exists. It’s color! It’s texture! It’s scale! It's the three pillars of design! 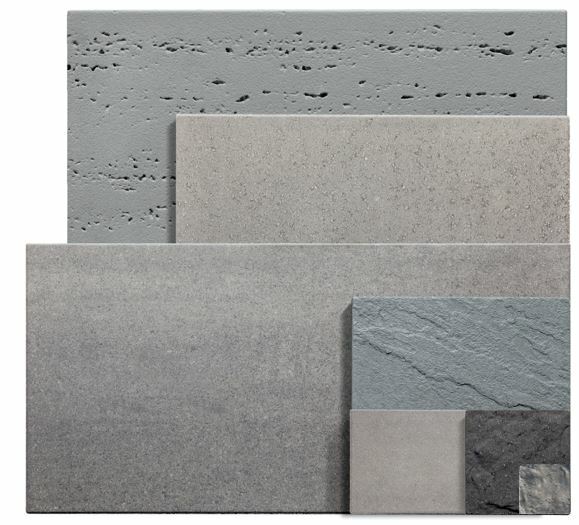 Now, mixing and matching different colors and textures isn't really a challenge, but adding in large scale or large format wall and slab products is a different story. In order to keep your team on their feet, large-format units should be lifted with the appropriate tools. A lack of proper lifting equipment will affect the productivity and health of your crew. In an industry that is currently suffering from a labor shortage, let’s face it: your crew members can’t break their backs. You can’t afford to have people calling in sick the morning of a big slab installation job. There needs to be a balance between product design and productivity, and we can help you find it. Maybe your tool inventory needs a little update before the season starts? Meet our partners from Pave Tool Innovators at their booth at our Contractor Showcase events to discover the best options currently available on the market. Plus, attend our presentation to learn how you can budget for these tools and how they can impact your productivity. They are worth your time and money! Have you seen our latest product releases? Click here to know what’s coming out in 2019. CHECK OUT OUR 2019 TECHO-SPEC TODAY!